I am trying to detect PCR positive result with color as attached image('2.jpg') which was implemented by somebody. 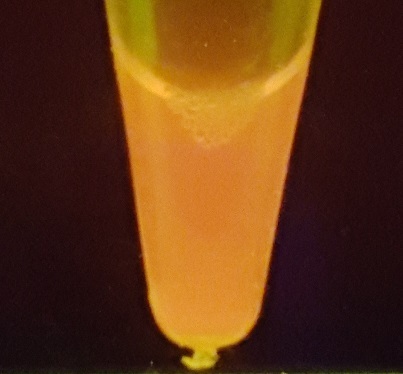 The 1~4 tube from the left on the image show fluorescence color(green color) as positive result, but the others show orange color as negative result. SYBR green dye was used in the experiment of '2.JPG'. '3.JPG' shows my result of PCR positive result dyed with 10-fold dilution of Gel green after amplification. The reason why I used 10-fold dilution of Gel green dye is to see the original color which is orange before amplification. The dyed PCR reagents become transparent over 10-fold dilution. As the result of '3.JPG', the color still remains orange color after amplification. I suspect that you will need to look at a specific wavelength and possibly excite with a specific wavelength too.